Tuesday September 7th 1926 It was a beautiful day. I had a letter from Hattie and wrote she and Edith Whetstone before ten oclock. I then went up town in a taxi. Was at the dentists and did other errands. Had lunch and went down to Lizzie Duncans for the afternoon. Will brought me home. Evening on the porch with the girls. Letter from Mrs Moore. 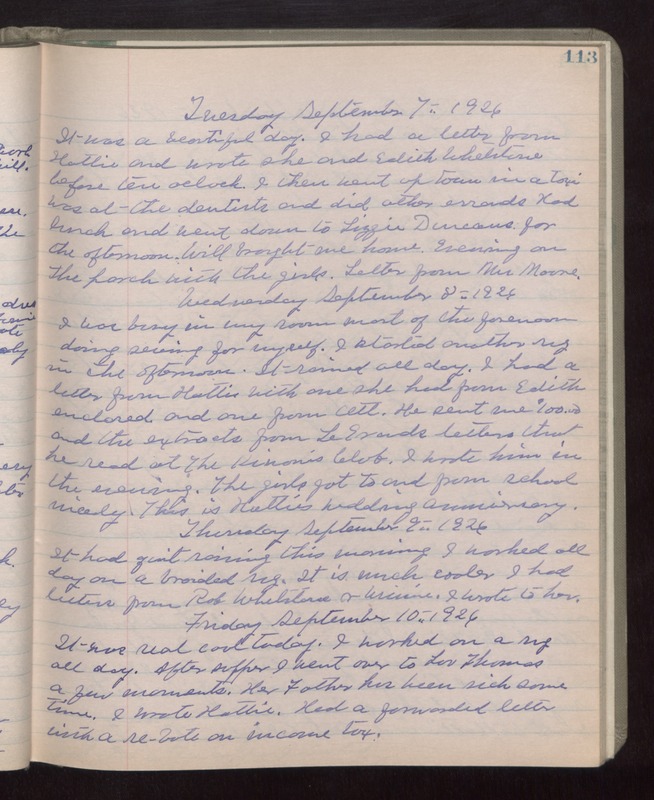 Wednesday September 8th 1926 I was busy in my room most of the forenoon doing sewing for myself. I started another rug in the afternoon. It rained all day. I had a letter from Hattie with one she had from Edith enclosed and one from Ott. He sent me $100.00 and the extracts from LeGrands letters that he read at The Kiwanis Club. I wrote him in the evening. The girls got to and from school nicely. This is Hatties wedding anniversary. Thursday September 9th 1926 It had quit raining this morning. I worked all day on a braided rug. It is much cooler. I had letters from Rob Whetstone & Winnie. I wrote to her. Friday September 10th 1926 It was real cool today. I worked on a rug all day. After supper I went over to Lou Thomas a few moments. Her Father has been sick some time. I wrote Hattie. Had a forwarded letter with a re-vote on income tax.